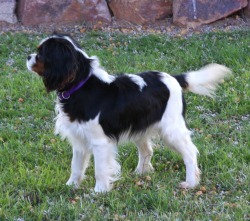 Leena is a tri-colored AKC Cavalier girl who weighs 12 pounds. Born and raised in our home, she is the daughter of Bailey and Kegan (now both retired). Leena has lovely tri and blenheim puppies with lots of color and beautiful coats like hers. She loves to run around our yard, visit the horse (whom she's not sure she can trust), and play ball.